Color(s): Varied shades of Brindle: blue, yellow, silver, gray, red, gold. The Dutch Shepherd breed originated during the 1800's in the Netherlands as an all-purpose dog. They were adept cart-pullers, herders, police dogs, and used for guarding. The Dutch Shepherd is considered to be very rare in North America, and is limited in their native Holland. They are highly prized for their quick reflexes and capabilities. The most distinctive feature of the Dutch Shepherd is the brindled coat. This breed is powerful, muscular, well-proportioned, and of balanced build. Dutch Shepherd's possess an expression of intelligence. The Dutch Shepherd is affectionate, lively, obedient, reliable, and faithful. They typically bond closely to one family member, although they are loving to their entire family. The Dutch Shepherd breed is protective and attached to their family, home, and territory and make excellent guard dogs. They are alert, active, and enthusiastic workers. They do best in a home with considerate children. Dutch Shepherd's do well with other dogs and other household pets. This breed will become destructive if bored or lonely. The short-haired and long-haired varieties of coat require regular brushing to remove dead and loose hair. The wire-haired coat must be professionally plucked twice a year. Bathing should only be done wehn absolutely necessary. 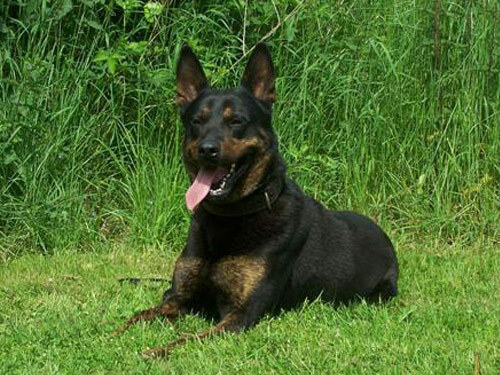 Due to the rarity of the Dutch Shepherd breed there are no known health issues. The Dutch Shepherd comes in three different varieties: Wire, Long, and Short. The Wire-Haired is coarse and of medium length. The Long-Haired is harsh, straight, flat, and long. The Short-Haired is dense, short in length, and of fine texture. All three coat types are weather-resistant. The Dutch Shepherd requires a dominant handler. This breed learns quickly and training must be varied to keep them interested and occupied. They excel in obedience, police work, military work, and guarding. Training must be done with firmness, fairness, and consistency. The Dutch Shepherd breed is not recommended for those with sedentary lifestyles. The Dutch Shepherd thrives on exercise, activity, and having a job to do. They are not recommended for apartment living and do best with a large securely fenced yard or rural setting. Physical and mental stimulation is absolutely crucial. They excel in agility, herding, obedience competition, and field trailing. Dutch Shepherd's also make excellent walking and jogging companions provided they are securely leashed.